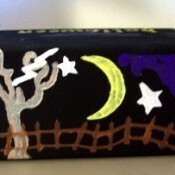 Halloween Candy BoxPainted wooden box to put your Halloween candy in. Use screwdriver to remove screws from hinges. Not a necessary step but makes it so much easier to paint. Craft Project: Pocket TagThis is a homemade tag to add to your scrapbook. I cut a blue piece of paper at about 3x4 inches, then tore around the edges. Elly (Great Dane)Elly is a 7 year old Great Dane. She was a rescue. We've had her for 4 years. She likes to tease the cow, and sit on people laps. 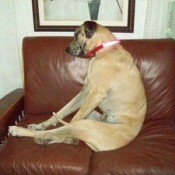 She wasn't treated too nice by her former owners so she is sometimes scared. Buddy (Terrier? )This is Buddy. I'm not sure of his breed, maybe terrier. He was a stray that showed up and decided he liked it so he stayed. Tile Art - Painting TilesI received some tiles as a free sample, they were about 2"x2". As you can see they were just plain white. 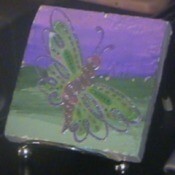 I did a stencil painting on one and on the other I painted then added a pretty butterfly sticker. 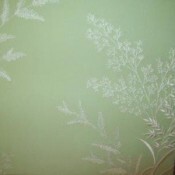 Make A Blank ScrapbookA fully made scrapbook with no pictures. For that person who doesn't have time to scrapbook, but would love to have one to show off their pictures.